I like chickpeas. Well, love chickpeas. I especially love them on salads. I love roasted chickpeas. And curried chickpeas. And chickpea mash. And on zucchini boats. Yes, I post recipes with chickpeas a lot. 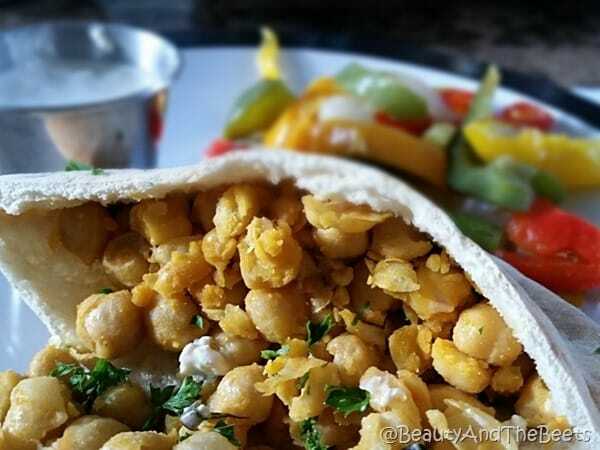 Chickpeas have gained a major boost since hummus has become so popular. You can find hummus at some many restaurants now it has become commonplace. Chickpeas are hip and cool now and part of our mainstream culture even if they are pureed into a dip. 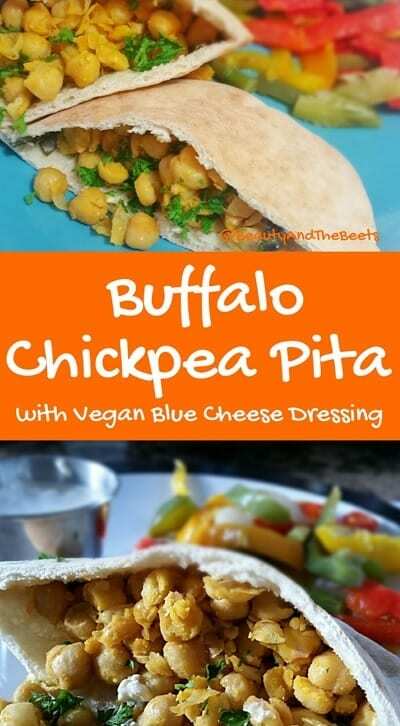 For years chickpeas have been an excellent source of protein for Vegans and Vegetarians. Chickpeas are extremely high in fiber and have been scientifically proven to help control blood sugar as well as assist with weight loss. But we who eat chickpeas on a regular basis know all this stuff. 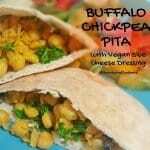 And we also know how versatile the chickpea is. When I ate meat, I used to love the flavor of buffalo sauce on chicken. Especially when dipped into a cool creamy blue cheese dressing. I have made Cauliflower Buffalo Wings in the past and loved them, but sometimes all I want is a little spicy flavor with some hot sauce. Something simple. 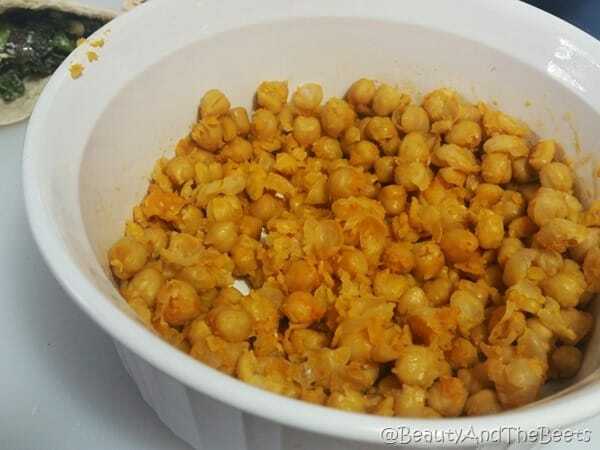 Enter the easy Buffalo Chickpea. I made these pita sandwiches when I was craving something spicy and had made a large jar of Vegan blue cheese dressing for another project. Not wanting to waste the dressing, I decided to coat some chickpeas with a little hot sauce, dry them in a sauté pan and add them to pita bread. And of course, what is a little buffalo hot sauce with celery? I minced celery so small and added it to the chickpeas before stuffing the pita bread, just to add a little crunch. To cool the spiciness down, I mixed some romaine lettuce with the Vegan blue cheese and stuffed the leaves into the pita. 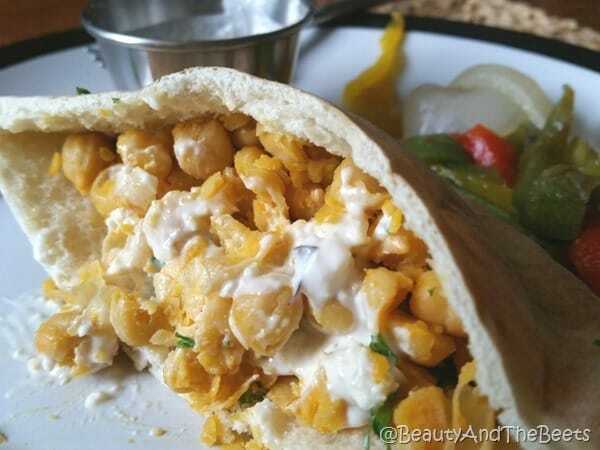 (Substitute the pita for a wrap to evenly distribute the salad and the chickpeas). To my surprise, Mr. Beet, who prefers his chickpeas pureed into hummus, loved these sandwiches and now I am confident I can start playing with chickpeas more often. I’m thinking chickpea cupcakes? To a medium bowl combine the Tabasco sauce, olive oil and garlic powder and mix well. 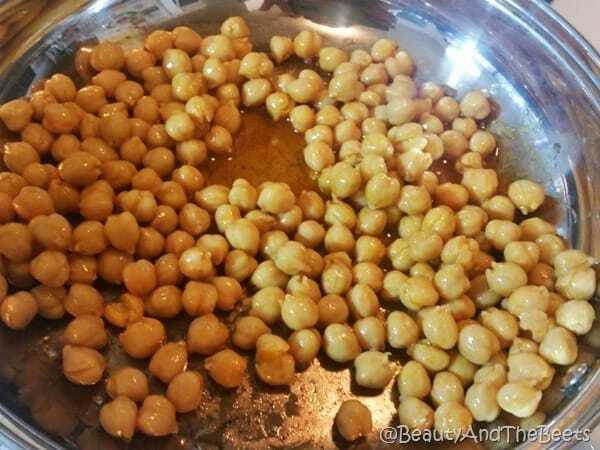 Add the chickpeas and toss or stir to coat with the sauce. Preheat a skillet or saucepan and add the chickpeas. Saute over medium heat for about 5 minutes, stirring frequently. Remove from the heat. 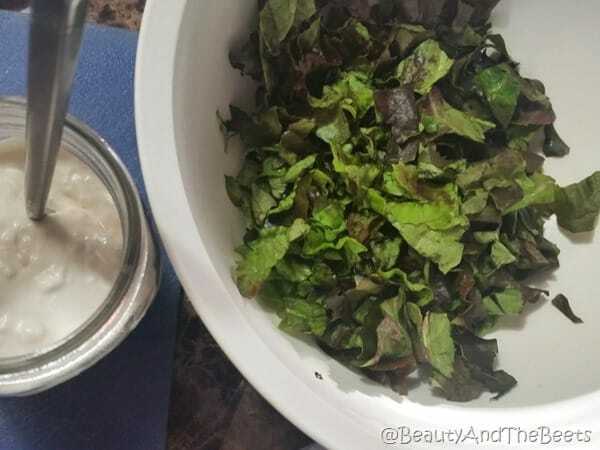 In another bowl, add the lettuce and blue cheese dressing together until the lettuce is coated well. You may need to use a little more dressing if the lettuce leaves are not coated enough. Carefully pop open the pita halves, and stuff the pitas with the blue cheese lettuce. 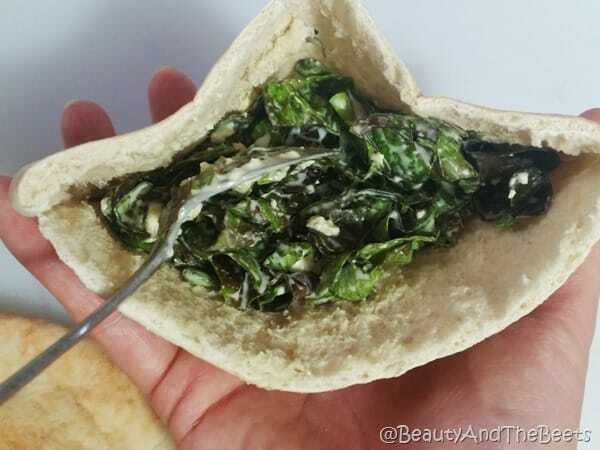 Use about 1 cup of lettuce per pita half. 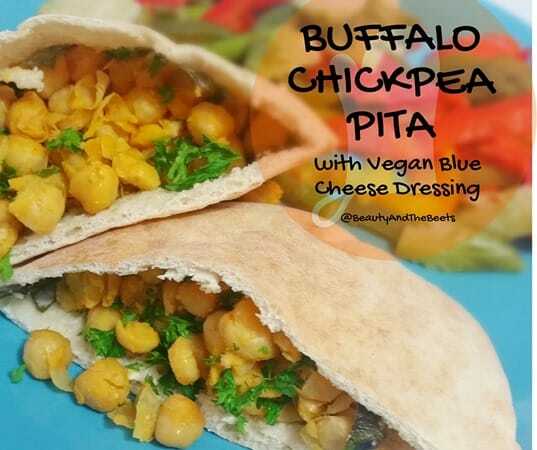 Mix the celery and parsley into the slightly cooled chickpea mixture and spoon the chickpeas into the pita bread, on top of the lettuce.